Late one afternoon in the fall of 1976, we were sipping Sanka and speculating on the possible directions towards which research and theory in organizational science might lead. 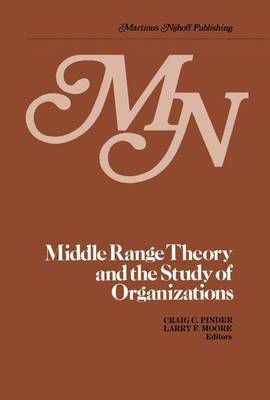 One of us had just re-read Walter Nord's Marxist critique of Human Resource Management, and the discussion evolved into an enumeration of the many articles that had appeared in the recent literature attacking the discipline, its mission, and its methods. In no time the list was long enough to suggest that a number of scholars, both young and established, were dissatisfied with the rate of progress begin made in the accumulation of knowledge about organizations. The critics we identified were located at many different schools, and they were associated with diverse research traditions and biases. The causes they identified as underlying the problems they cited varied, as did the solutions they offered. We decided to pursue these polemics with a view to seeking com- monalities among them, hoping that if there were any dominant common themes, it might be possible to anticipate the directions the field could take. Our reading and thinking led us to the conclusion that many of the issues being raised by the critics of the discipline could be seen as disagreements over some implicit (or ignored) metaphysical and epistemological assumptions about organizations. We hypothesized that much of the controversy resulted from a lack of consensus regarding what organizations are and how knowledge about them can be developed.